Do you see all those ribbons on the uniform above? Do you know what they stand for? In the 38 years since 1977 when he joined up. Guess Breedlove could never decide where his loyalties were. 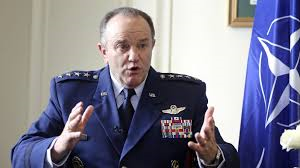 Breedlove is now the top NATO COMMANDER in Europe? I guess NATO has no one with any experience, in any wars, to run their current failure, in the current war with the EU & Russia: How else can anyone explain the torrent of lies flooding from the mouth of this inexperienced pencil-pusher? So the whole world can quake in fear from his military magnificence in all the battles that he managed to avoid fighting, in since 1977. Without ever managing to get involved in a single fire fight?